Dallas Cowboys’ third round pick Chaz Green is headed to the physically unable to perform list after undergoing hip surgery on Wednesday, and owner Jerry Jones admits the team isn’t sure at this point just when he’ll return, if he returns at all in 2015. “When we looked at it, rather than take a chance on it being still there and lingering or exacerbating in training camp, we thought go ahead and get it done,” Jones said, per David Moore of the Dallas Morning News. “It could limit him and will limit him early in training camp, but whether or not he’s a PUP situation for the year or not remains to be seen on his rehab. A Florida product, Green is no stranger to battling back from injury. 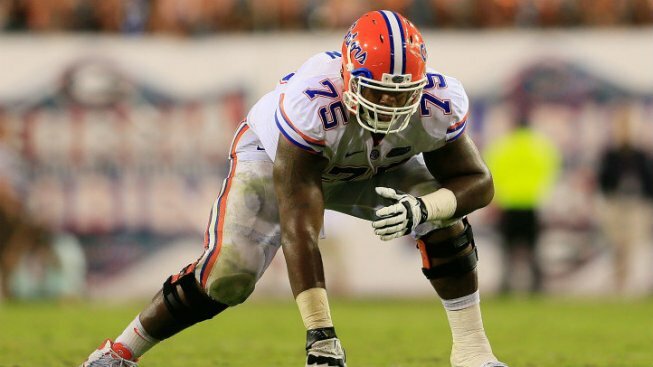 He missed the Gators’ 2013 season with a torn labrum before returning to start every game in 2014, appearning both at left and right tackle. He was made the 91st pick in the 2015 draft by the Cowboys.